Cassandra Jean is working on some City of Heavenly Fire postcards, which feature drawings from scenes from the book. She shared a rather emotional one featuring Jace and Brother Zachariah. I drew this scene and thought “Technically this is still Heronstairs” and then I made myself sad. City of Heavenly Fire will be available on May 27, 2014. What do you think of the postcard? How are your Heronstairs feels doing? amazingly drawn and you can feel the emotion. this may be a really sad but also tender (maybe even hope inspiring and comforting) scene. i’m wondering if its has reason due to alec maybe dying? with alec. i hope not. he is been trougj enough. God, my feels…. Two of my beloved characters interracting… me ————-> dropped dead. 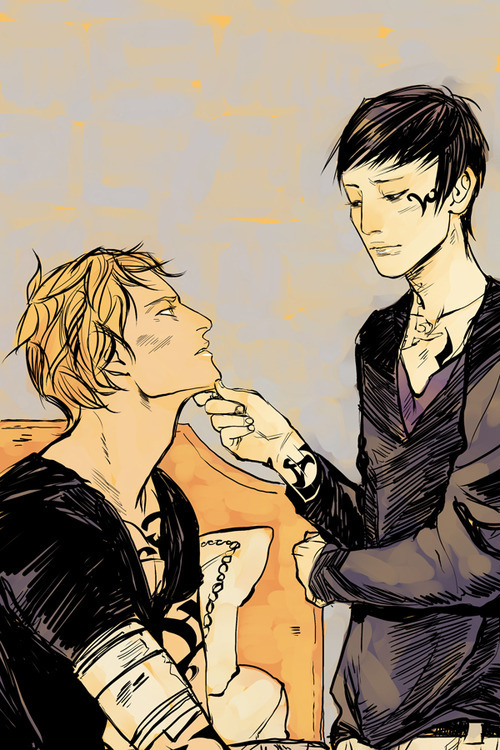 My Heronstairs feels are too much to handle!!! What’s up with the bandage on Jace’s arm? My feels are going to be dead by the time this book comes out! The feels are too much,what arm is the parabati rune on because of jaces bandage losing alec would be unthinkable. This must be the very first normal Jem fully drawn. I feel like crying when I see this. I wonder how jace got that bandage on his arm for? Also really excited on seeing more postcards from the book being made. i need to know what happens!!!!!!!!!!!!!!!!!!!!!! He looks so sassy , jem i mean !!!! But now he looks normal , i really want to see how he treats the TMI kids with his non silent brotherness . Humble , calm or cold ?????????? ?